1 Combine , Hellmann's® or Best Foods® Light Mayonnaise, lime juice, cilantro and garlic in small bowl; reserve and set aside 1/2 cup. 2 Alternately thread chicken, vegetables and pineapple on 6 (12-inch) skewers**, then brush with remaining mayonnaise mixture. 3 Grill or broil skewers, turning once, until chicken is thoroughly cooked and vegetables are tender, about 8 minutes. Brush with some of the reserved mayonnaise mixture. 4 Serve with remaining reserved mayonnaise mixture as a dipping sauce. Serve with hot cooked rice. TIP: For no skewer oven method,  preheat oven to 425°. Combine mayonnaise mixture as directed, reserving 1/2 cup. Combine chicken, red peppers, zucchini and remaining mayonnaise mixture on large rimmed baking sheet. Roast 20  minutes or until chicken is thoroughly cooked and vegetables are tender. Stir in pineapple and 2 Tablespoons reserved mayonnaise mixture. Serve as directed. Cost per recipe* : $11.47. 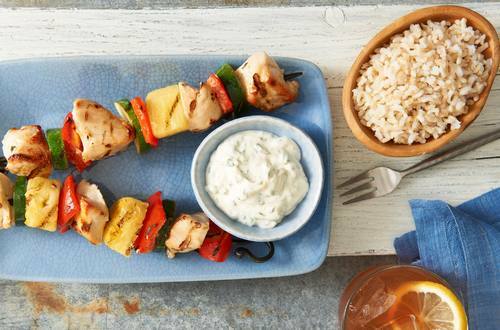 **If using wooden skewers, soak in water at least 15 minutes prior to use.